There is a tragically close connection between addiction and emergency responders, who often turn to alcohol or drugs to cope and socialize. Emergency responders are first on the scene of some of the most dangerous and demanding situations, providing immediate care, support, and medical assistance to survivors in the aftermath of a crime or disaster. These heroic duties are essential to society; however, they can be very strenuous and emotionally-draining to those in the profession. The constant exposure to devastation, life-threatening situations, and physical strain of working long hours under stressful conditions can negatively impact overall mental health. Consequently, there is a tragically close relationship between addiction and emergency responders. The term “emergency responders” includes police officers, firefighters, and emergency medical services such as paramedics and EMTs. These industry professionals are exposed to situations that many people would not be able to emotionally bear, increasing the risk of the development of mental health disorders. In fact, it is estimated that 30% of first responders develop behavioral health conditions during their time of service, including: depression, anxiety, and post traumatic stress disorder (PTSD). Despite the importance of mental health in the profession, there is an undeniable cultural stigma concerning mental healthcare treatment. Fear of being seen as weak or not up to the job of a first responder keeps many from seeking help and can lead suffering individuals to turn to substance abuse as a means of relief. When a person turns to alcohol or drugs for self-medicating purposes, they are more likely to become dependent upon that substance than an individual that is a recreational user. In fact, those with mental health disorders are thought to be around 50% more susceptible to addiction. Due to acute stress and trauma, it’s common for emergency responders to develop co-occurring mental health and substance use disorders. As a result of their occupation, police officers face a great deal of stress and trauma on a day-to-day basis. In addition to the threat of physical harm, officers are constantly witnessing devastating and disturbing events such as murder, suicide, domestic violence, and illicit drug abuse. Those in law enforcement additionally experience work-related stress regarding their roles and reception in the community. While police officers are at lower-risk for drug abuse than the general population, they at a significantly higher-risk for alcohol abuse. A 2010 study of police officers working in urban areas found that 11% of male officers and 16% of female officers reported alcohol use levels that are deemed “at-risk” by the National Institute on Alcohol Abuse and Alcoholism. Researchers attribute the high alcohol consumption rates among police officers to both social and stress-induced drinking behaviors. Of the social factors identified in hazardous alcohol consumption, the primary one was drinking to “fit in” with peers; 25% of police officers report drinking “to be part of the team” during social outings. The most important contributor to alcohol consumption among police officers, however, is the stress and trauma officers face daily in the line of duty. Firefighters spend their days braving burning and collapsing buildings to save civilian lives. 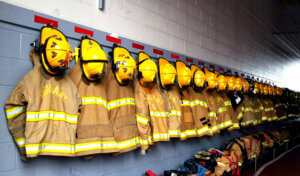 Firefighters are subject to many of the same traumatic psychological risks as police officers but are at the additional physical risk of severe burns, smoke inhalation, and lung damage. The long 24-hour shifts and traumatic calls lead countless firefighters to develop mental health conditions such as post-traumatic-stress disorder, acute stress disorder, and depression. Many individuals struggling with these issues then turn to drugs and alcohol as a means of symptom relief. The National Survey on Drug Use and Health revealed that up to 29% of firefighters engage in alcohol abuse and as many as 10% of firefighters may be currently abusing prescription drugs. Rates of binge drinking and heavy alcohol consumption are higher among firefighters than the general population. Similar to police officers, there are multiple social factors contributing to the high rates of hazardous alcohol consumption among firefighters, including acts of camaraderie and peer support. A number of firefighters additionally report using alcohol as a means of managing the stress of emergency calls and for “unwinding down.” Aside from seeking support from friends and family, alcohol use was reported as the second leading coping strategy of firefighters in a 2017 survey. Paramedics and EMTs are emergency medical service technicians that are dispatched to the scene of an emergency, which can include traumatic incidents such as car accidents, fires, personal injuries, and shootings or stabbings. In addition to serving 24-hour shifts, EMTs are responsible for life and death decisions regarding their patients such as drug dosages and methods of treatment. These professionals face a number of occupational hazards while on the job and, like police officers and firefighters, are also at greater risk of developing mental stress-related disorders than the general population. According to SAMHSA, 36% of EMS workers suffer from depression, 72% of EMTs suffer from sleep deprivation, and more than 20% of EMTs suffer from PTSD; all of which puts them at an increased risk of substance abuse. Drug abuse is much higher among paramedics and EMTs compared to other emergency responder professions, as these individuals have easy access to potent and addictive prescription medications. The stress and trauma that this industry incurs drives many professionals towards substance abuse as an effort to cope with the severe psychological strain they encounter on a daily basis. Seeking treatment for addiction issues can prove to be difficult for many people, especially emergency responders who are used to being the ones helping others. However, you have to take care of yourself first before you can help the others that may need you. The trauma and stress that emergency responders encounter on a daily basis can be debilitating and push industry professionals to substance abuse. If you’re a first responder struggling with addiction, know that you’re not alone. Contact a dedicated treatment specialist to learn about your options today, and start on the path to recovery.